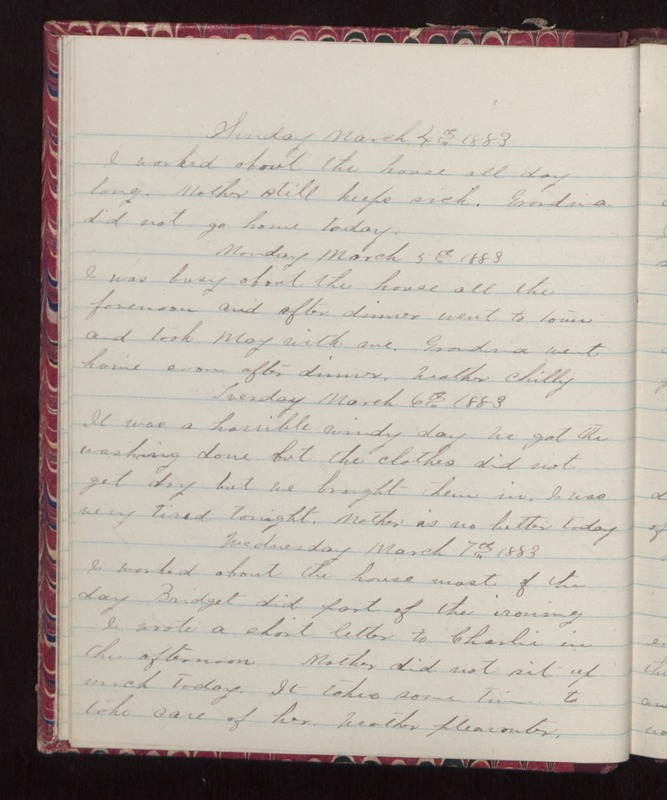 Sunday March 4th 1883 I worked about the house all day long. Mother still keeps sick. Grandma did not go home today. Monday March 5th 1883 I was busy about the house all the forenoon and after dinner went to town and took May with me. Grandma went home soon after dinner. Weather chilly Tuesday March 6th 1883 It was a horrible windy day. We got the washing done but the clothes did not get dry but we brought them in. I was very tired tonight. Mother is a no better today. Wednesday March 7th 1883 I worked about the house most of the day Bridget did part of the ironing I wrote a short letter to Charlie in the afternoon Mother did not sit up much today. It takes some time to take care of her. Weather pleasanter.